Have we talked about chickens? This is little white chicken. We don’t really have a name for her, so that’s what we call her. She’s also the sole survivor. She started in a brood of five. All of her siblings were taken out by other animals. She was joined by a black Austrolope who was taken out as well. And then later we added three Bardrocks, all gone. She’s basically an Auschwitz survivor. I’m writing about her because four weeks ago she took to roosting on the front porch. Up until then she was totally happy roosting in her coop. For two years, at dusk each night she’s gone in there and put herself to bed. It was fine. But four weeks ago her last sister was taken out by a dog right next to the coop. Ever since then, she’s been afraid to go to sleep in her customary home. 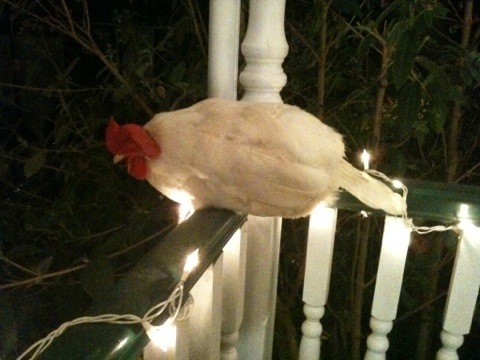 So instead, at dusk, she goes up on the porch and puts herself to bed on the railing where it’s much more safe. Let’s think this one through. She’s a chicken. But she prefers this to that. Even more fundamental, she can discern this from that. That means she has discernment. And she has preferences. Preferences and discernment define sentience. She is aware. Furthermore, she doesn’t go near her old home because she associates it with the death of her sister (she was besides herself the morning it happened). She had an emotional response. A bunch of neurochemicals kicked off inside her. It doesn’t matter whether those neurochemicals expressed fear or sadness or anxiety. She felt something and associated that feeling with an event. She has chosen to sleep somewhere else because she will be safer. She feels and she is self-aware. On Tuesday morning, I heard her going nuts in her coop. I looked out the window and saw the two dogs that killed her sister running about maybe 600 feet distant. They were hardly visible, let alone a threat. But she appeared to remember. Each day she goes over to play with the chickens next door. She prefers this. Then she comes back with them to have a little party at our house. They eat and scratch through the compost pile. She prefers to be with other chickens. She craves the social interaction. She is a social animal who finds pleasure or safety or satisfaction in being with another living creature similar to herself. In the evening the chickens return to their respective homes and put themselves to bed. And it begins all over again the next day. Granted, she would have a hard time building a rocket ship. But then again, so would most human beings. When can we stop privileging ourselves over others?